Westlife are back! It's been 20 years since they smashed into the charts in 1999 with 'Swear It Again' and went on to achieve a staggering 14 number one UK singles, selling 55 million records worldwide. Now, their highly anticipated reunion tour – which sold out in minutes – is coming to cinemas worldwide on Saturday 6 July. The final spectacular show of the UK and Ireland leg of the 'The Twenty Tour' will be broadcast LIVE to cinemas from Dublin's iconic Croke Park stadium. 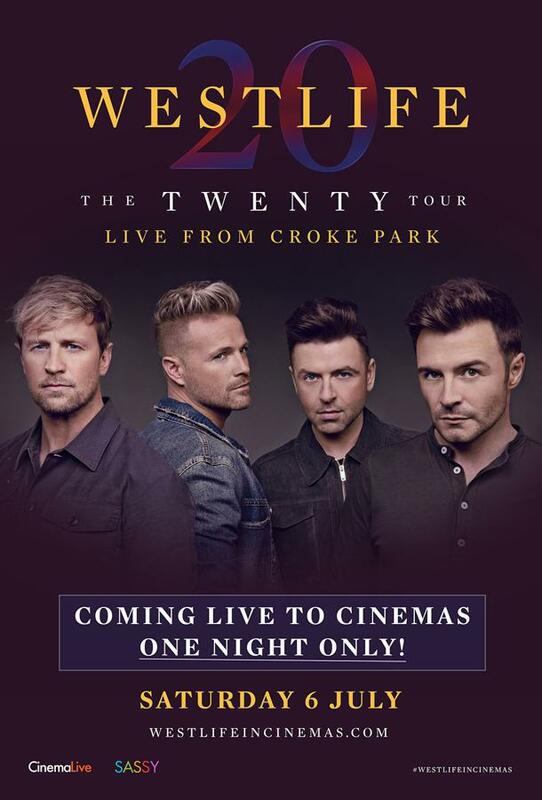 Irish heartthrobs Shane, Nicky, Mark and Kian will perform brand-new music alongside their greatest hits and all 14 of their UK No.1 singles, including 'Uptown Girl' 'Flying Without Wings', 'You Raise Me Up' and 'If I Let You Go'. For one unforgettable night, Westlife fans from coast to coast will raise the roof once more, in celebration of one of pop's most sensational comebacks.